Those were the words in Ross Watson’s on-line diary this morning after he stood atop Mt. Logan’s West Summit at 5:22 p.m. Thursday, making him the first blind man to climb Canada’s highest mountain. The Alberta lodge operator and outdoor adventurer reached the West Summit at 5,920 metres with VisionQuest 2000 team members Graham Holt, Geoff Skinner and expedition leader Jay Honeyman. Suffering from severing altitude sickness, videographer Alex Taylor and photographer Karsten Heuer were unable to summit with their teammates. Although the feat is wonderful for Ross, the message he wants other people to understand is that society can expect more of people with disabilities, particularly those who are blind. “Together with CNIB (Canadian Institute of the Blind), I want to raise society’s bar of expectations and demonstrate the abilities of people who are blind,” said Watson. Ellie Shuster, a spokeswoman for the CNIB Alberta, said in an interview today the team should be in Whitehorse in about three days. It could take longer depending on the weather, which has been an obstacle for the team throughout their trek. 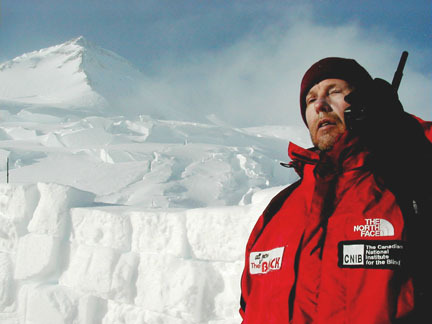 Despite the doubts, Watson said, “The whole epic up to the top was really so difficult, it felt like a heck of an achievement!” It will take three plane trips to get the six team members out of the Kluane ice fields. Before heading downhill today, the team had to climb 1,000 m to get out of the col the team has been camped at for the past two nights. Once they reach the top of King’s Col, where Taylor and Heuer are recovering, it will be a quick ski down to the base camp, said Shuster. Watson will have someone behind and in front of him, guiding him down the hill, she said. The most interesting thing about Watson’s achievement, said Shuster, is that he doesn’t see how, as a blind person, what he’s done was any more of a challenge for him than for his teammates. Film footage shot throughout the climb will be used to create a 24-minute educational video the CNIB plans to distribute to schools throughout Canada along with a CD Rom of the Web site. Although she’s not sure how much the package will cost, Shuster said she wants to price it low enough so schools can afford it and she can get the message of Watson’s climb out. “My primary objective is to educate and to break even,” she said. The sale of the package will ensure costs are covered for its production.